THE BENEFITS OF UNITAR PROGRAM FOR COMMUNITY EMPOWERMENT FOR PROGRESS ORGANIZATION-CEPO. This small writing is intended to share with the public the impact that CEPO gained from Ms. Grace John Kenyi participation in the UNTAR fellowship Program. CEPO as an institution observed greater change in Ms. Grace John’s capacities in performing her office duties and responsibilities. She was observed by various colleagues in CEPO as being transformed professional and effective staff for delivering her office work. Grace John Kenyi has become a mentor in CEPO especially the staff under her supervision gained awesome experiences including the rest of her workmates in CEPO office. Beyond supporting CEPO Staff, some staff from more than five civil society organizations approached CEPO for nomination to attend UNITAR because they saw Ms. Grace has improved her leadership skills and professionalism that encouraged them to join UNITAR. CEPO secured one seat for female staff in 2017 and now three seats for three staff as two seats for female and one seat for male because of Ms Grace John effectiveness during UNITAR program. 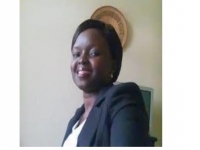 Ms. Grace John is currently engaged in developing national strategy for championing home-grown mediation, negotiation and dialogue for South Sudanese communities. She succeeded in structuring national conflict early warning system and early response system.